At Ace, we’re proud to be part of a community filled with people dedicated — and actively working — to make the world a better place. In the past, we’ve devoted blog space to our customers and vendors making waves in terms of health and the environment. 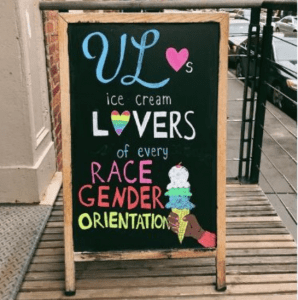 This month, we want to highlight the support they give to social issues. 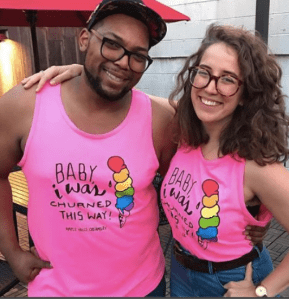 Keep reading to see how a few Ace customers celebrated the LGBTQIA+ community in June 2018 AKA Pride Month! We’re big fans of Ample Hills’ flavor Baby, I Was Churned This Way! 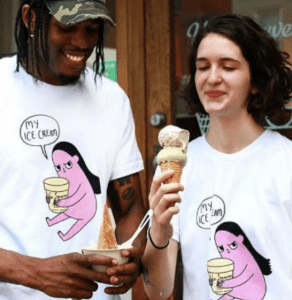 which they describe as a “salty hazelnut ice cream studded with chocolate-covered rainbow-colored sunflower seeds.” Last month, they also released limited-edition Baby, I Was Churned This Way! tank tops. The best part? 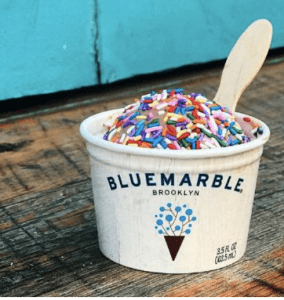 $1 of each sale — of both tanks and pre-packaged pints — went straight to Brooklyn Pride. 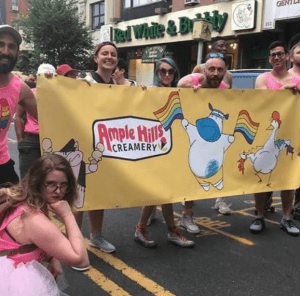 For more on how Ample Hills celebrated, read their blog post. 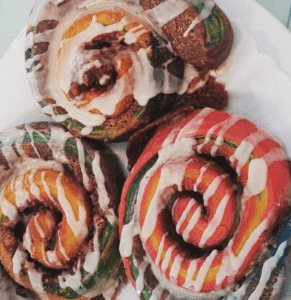 The always-creative Cinnamon Snail made some truly innovative sweets to celebrate Pride, including their vegan “Love is Love” Raspberry Cheesecake & Caramel Apple Crumb Cookie Donut. 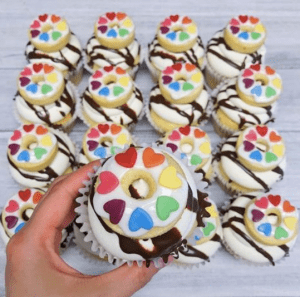 For National Donut Day, they created Pride-themed vanilla cupcakes with ganache filling and topped them with vanilla buttercream. We’re sure the cupcakes were just as delicious as they were photogenic! 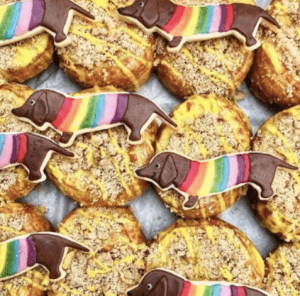 And, of course, we also loved the look of their Doxie Rainbow Pride Lemon Curd Cookie Donuts. 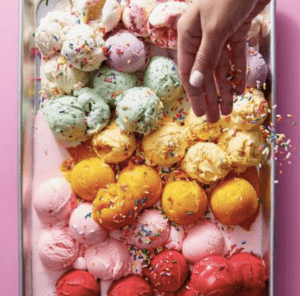 It warmed our hearts to see this Pride-themed concoction on the Blue Marble Ice Cream Instagram feed. You can never have too many rainbow sprinkles, right? 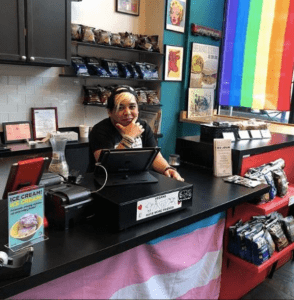 …while Blossom du Jour decked out their 81st St. location with some serious Pride swag. 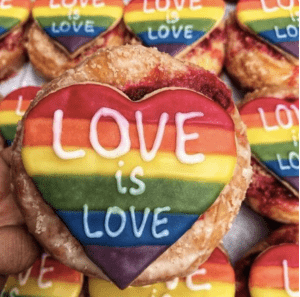 And last but not least, we loved this subtle but lovely Pride-inspired post from Blue Apron. Thank you to the whole Ace community for striving to make the world a more inclusive place. 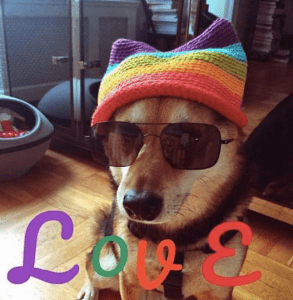 Happy belated Pride, everyone!